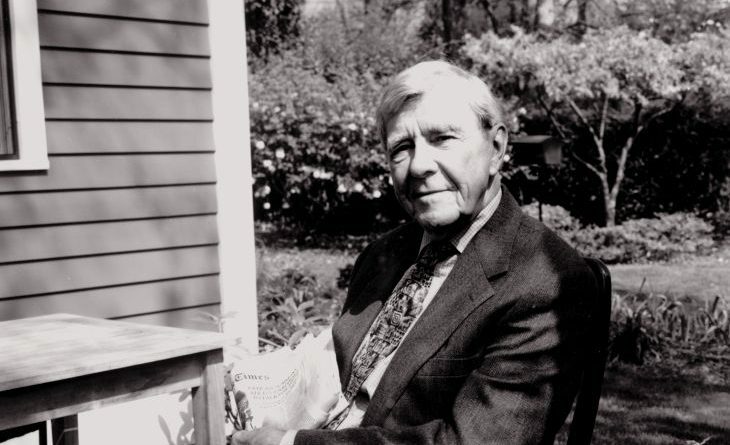 After a long career as a newspaperman, novelist, humorist and double Pulitzer Prize winner, Russell Baker died Monday in his Leesburg home at the age of 93. Born Aug. 14, 1925, in the western Loudoun hamlet of Morrisonville, Baker was a columnist for The New York Times from 1962 to 1998 and hosted Masterpiece Theatre on PBS from 1992 to 2004. He won his first Pulitzer for distinguished commentary in 1979 for his Observer columns. His second came in 1982 for his autobiography, “Growing Up,” including his childhood in Morrisonville in western Loudoun. He lived on West Loudoun Street in downtown Leesburg. As the plaudits for the legendary newsman rolled in this week around the country, Baker is also being remembered by a number of his Loudoun friends. Waterford resident and photographer Susanne Page first got to know Baker and his wife, Mimi, in the 1980s when she and her husband, author Jake Page, were living in the village. Later, the Pages went out west for a number of years, but Susanne returned to Waterford after her husband’s death in 2016. She immediately reconnected with Baker, who had also lost his beloved partner, Mimi, who died in 2015, and they resumed their friendship. His family invited her to spend time with her old friend—so she’d just go and hang out with him. “What I loved about him was how curioushe was,” she said this week. He would ask her questions such as: What do you like to talk about? What are you going to do this morning? What are you are looking forward to? A man of many talents, he loved baseball, about which he was very knowledgeable; wrote musical comedy; loved all kinds of music—blues, old-fashioned rock songs—and “had a beautiful singing voice,” Page said. When she met Baker, “I lost my heart to him,” and the two couples became dear friends. It was at her suggestion that her husband asked Baker if he would like to have lunch with him—an invitation that was quickly accepted. That first lunch morphed into a wonderful weekly lunch foursome that has continued to the present day. Dennis also cited Baker’s gift for friendship and his “faithfulness” to his friends. “If you were his friend, you knew it,” she said. Another longtime friend and member of the lunch group, Joe Motheral, treasures his participation in the weekly gatherings. He first met Baker in Bluemont years ago, when Baker was invited to speak at a fundraiser for the fire department. Somewhat quaking, Motheral asked what the problem was. He needn’t have worried. Huntington said Baker was a wonderful person to work with, warm and friendly, thoughtful and very articulate, with a good sense of humor. “I had expected to be nervous, and was rather intimidated—but he put me at my ease right away—it wasn’t at all intimidating,” she said.